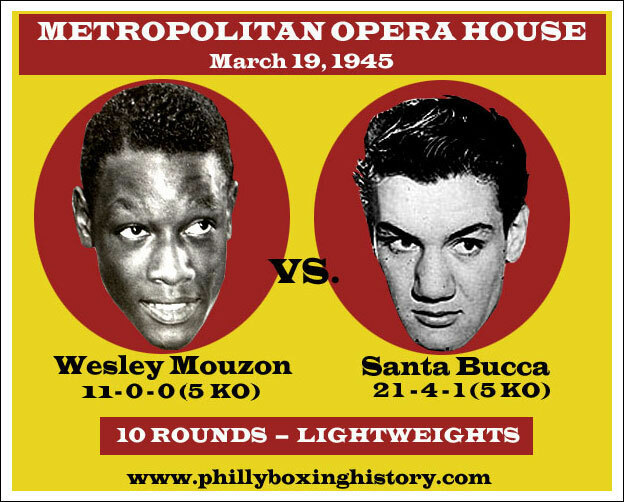 On this day in 1945, North Philly's Wesley Mouzon looked like a future champion in his first main event bout. His opponent was the more experienced Santa Bucca, who brought in a record of 21-4-1, while Mouzon was seeking his 12th straight win. A crowd of about 3,000 attended the scheduled 10-rounder, which was held at the Met on North Broad Street. Bucca opened the bout by winning the first round with his more aggressive style. But Mouzon got on track in the second by using his left jab. He continued his work in the third and as the round was winding down, Mouzon crashed a mighty right on to Bucca's chin which dropped the South Philadelphian dramatically. Bucca was down and out and did not so much as twitch during the 10-count. It was his second consecutive knockout loss and earned him $650. Mouzon took home $457. For Mouzon, it was an impressive showing and foreshadowed the teenager's shocking KO of Bob Montgomery which would come a year later.